It’s July, so it’s time to sketch. Mind you, it is time to sketch in all the other months too. 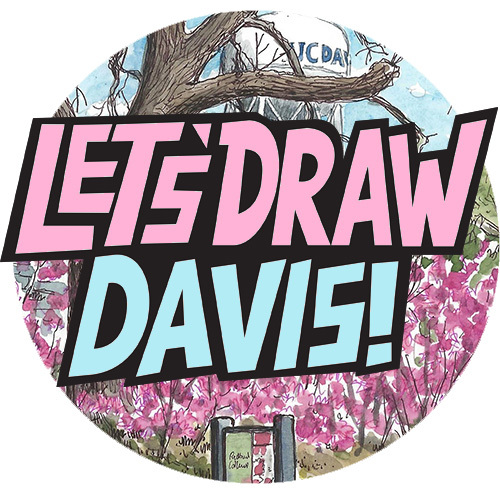 But “Let’s Draw Davis” is back – and definitely monthly again. It used to be monthly until I got very busy and wasn’t able to organize it so often, but now there are three of us organizing these sketchcrawls, taking turns each month – many thanks to Alison Kent and Ann Filmer. July is my turn, so if you’re in Davis, join us on Saturday July 15! A new aspect of the sketchcrawls that we are trying is that there will be a short sketching tutorial at the start by the organizer (me in this case), before heading out to sketch. So at 10am I will give a brief urban sketching tutorial, a few basic tips and techniques to try. We will start at Orange Court, the little courtyard off of E Street (between 1st and 2nd), and the theme this time will be to explore the hidden spots of Davis – the alleys and courtyards of downtown. We will finish up at the space behind the Pence Gallery, off of D Street, to look at each other’s sketchbooks. 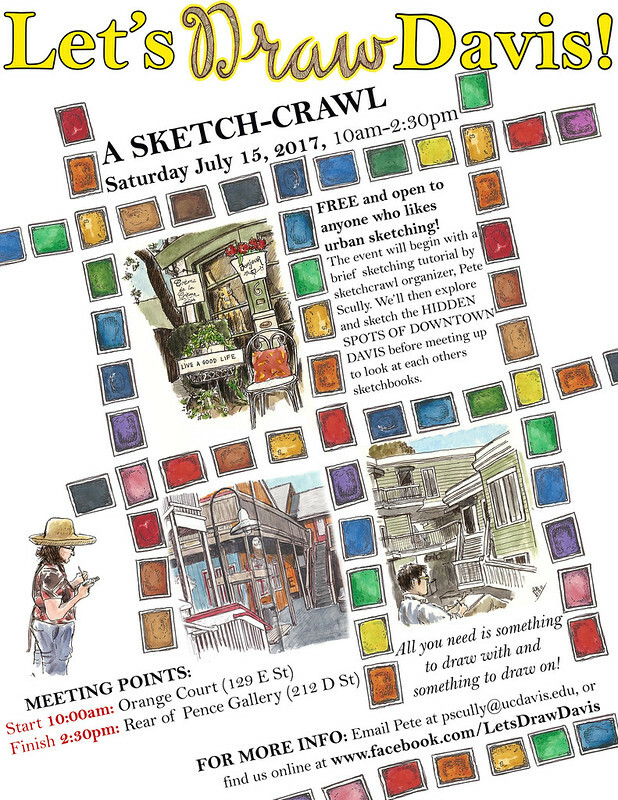 As always this sketchcrawl is FREE and open to the public. All you need is something to draw on and something to draw with. Oh and maybe a cold drink, because it’s always hot in Davis in July. There are plenty of places nearby to cool off!